Would You Ever Move to a Tropical Island? Have you ever thought of selling it all and making the move to a tropical island? It's been on my mind recently, from totally out of the blue. I was chatting with an acquaintance a couple of days ago, who said he was heading to the Caribbean next week for vacation. I asked him where he was headed and he said "Nevis Island." 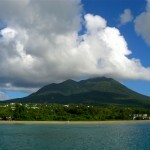 I told him I had never heard of Nevis before, … [Read more...] about Would You Ever Move to a Tropical Island?